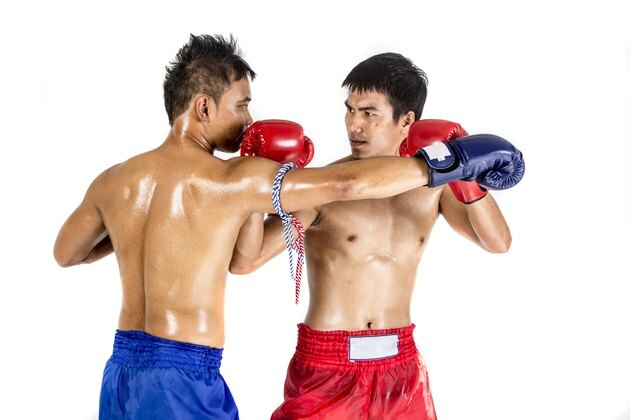 Kickboxing is a martial art that allows both punches and kicks. It is practiced as a competitive contact sport, a method of self defense and a fitness program. Belt grading systems are used by some kickboxing schools as a way to both inspire and demonstrate a student’s advancement in the sport. As with karate, belt grading systems used in kickboxing begin with the white belt. If you join a kickboxing school that employs such a system, you will automatically be given a white belt. This is the sign of the untrained novice, the color representing innocence and therefore a lack of danger. According to “Kick Boxing” by Eddie Cave, a white belt student then progresses to yellow, orange, green, blue, purple and brown belts. Variations do exist between schools. The British School of Kickboxing, for example, awards a red belt before the yellow and also includes extra striped belts in the later grades. It takes about four months on average to advance between grades at the British School of Kickboxing. Advancement times are longer at schools with fewer belts. If you are training in a school that uses the belt grading system, your ultimate goal will be to obtain a black belt. As in karate grading, a kickboxing black belt represents the completion of your basic training. However, training does not end here. As highlighted by the Fightscope website, a kickboxer can continue his training into the later black belt grades, the 1st, 2nd and 3rd dan levels. Progressing from a white belt to a black belt can take a long time. John Ritschel, in “The Kickboxing Handbook,” states that it can take three to four years to attain a black belt. However, the belt grading system is not officially regulated and standards can differ between kickboxing schools. The Fightscope website sees six to seven years as a respectable amount of time in which to achieve a black belt.